Happy Monday everyone, and woo hoo---we made it to Christmas week! This month has flown by (don't we say that every month? ), and it is busy, busy, busy over here at #teamwhyhome. 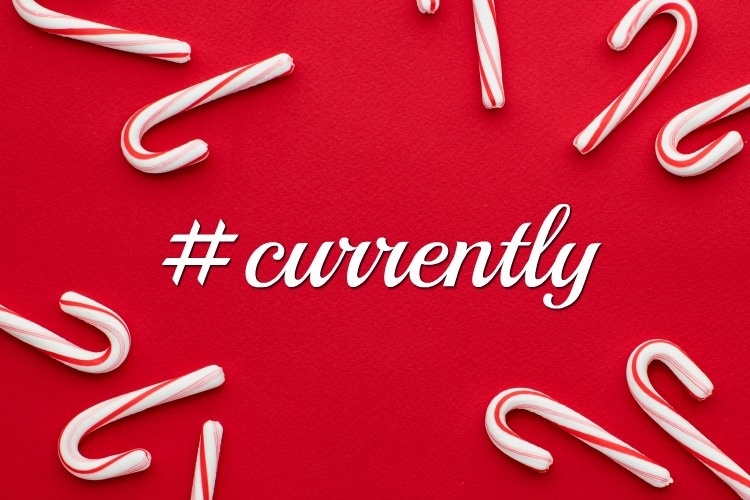 Lately I have been enjoying writing #currently posts instead of the Awkward & Awesome link up. There wasn't much participation, so I am going to scrap that moving forward. Thoughts? Reading: I'm still trucking through The Pillars of the Earth by Ken Follett. It is just so long, guys. I'm also re-reading Harry Potter and the Sorcerer's Stone because my parents got me the ILLUSTRATED VERSION for my birthday. I opened it and just. couldn't. even. I also got a new Kindle Paperwhite on Cyber Monday, and I LOVE it. I bought it for school, but I am thoroughly enjoying reading all the things. Deciding: Right now Dave and I are deciding on our focus words, and what goals we have for 2017. I think I know what my word is going to be, but I also want to set some goals for our family. I will definitely be writing about this in a future post. Pinning: Different recipes to make for my book club meeting. I am hosting (tomorrow...), and I am so excited to not only host a party but to use all the serving ware that we got for our wedding. This is a +1 in the #adulting category. Do you have any recipes for good bite-sized treats that are good for parties? Munching On: Caramel corn. You guys-- ALDI has the freaking most delicious caramel corn in all the land. It is so good, and Dave and I basically fight to finish the bag. We have also been known to open the bag and start eating it while still in the store. Because #priorities. If you live near an ALDI, you have to check it out (we usually find it in the snack aisle). Sipping On: So much coffee that it's disgusting. I probably have 3-4 cups per day at work. I just found one of my old candle warmers, and I have been using it to keep my coffee warm. I would like to think that my caffeine consumption isn't so bad and that I'm drinking warm beverages to stay warm, but let's face it. 3-4 cups is a lot. Waiting For: My poor baby is getting spayed on Wednesday. I have to work, but Dave is going to take her. It has to be done, but that doesn't make me any more worried or sad for this little furball. Trying Out: I planned out the whole month of December in blog posts, and it has been SO MUCH easier for me. I am able to write ahead a little bit more and focus on curating good content. I have to admit, that I did throw in an extra post per week so that I could include some gift guides, and THANK YOU all for being so supportive! I am going to try to do the same for January! Wearing: All the layers. It is COLD here in Pittsburgh. I got this exact jacket in Navy at Burlington for only $90, and it has been a life saver. It has a double layer zip, which is so handy to keep you nice and toasty. I am still in the market for a nice, warm peacoat, but I can't find anything I love. Recommendations? Buying: This kind of also goes under reading, but I just switched my Audible subscription to a Kindle Unlimited subscription, and it is going to SAVE me $5 per month. I have loved having an Audible credit every month, but I think that you get more for your money with Kindle Unlimited. I've heard that some people run into the fact that they don't have everything they want on there, but I'll let you know. Craving: Christmas Pudding. It's so close I can feel it. We have enjoyed this tradition for a LONG time. I always look forward to the flaming pudding and the brandy sauce. YUM. When I realized that the brandy sauce is actually alcoholic, it just made me love it more. Made my first christmas plum pudding!! Excited For: We are visiting Rochester for Christmas, and bringing Miss Ruby! Please #prayforme because it is a 5-hour long drive, and our stubborn kitty does NOT do well in the car. This is going to be a big test for these cat parents, but I am so excited for our family to meet her! Oh, and I guess I'm excited for Christmas too.